I had a day off today, on account of some time off in lieu I built up a while back at work. Strangely enough, I still found myself swatting away that creeping bleak Sunday evening feeling yesterday, even though I knew Monday was entirely mine. However it really was a lovely quiet little weekend. I baked, and Tim and I had burritos and grilled corn and Bloody Marias for brunch (the difference between a Mary and a Maria is vodka and tequila, to which I found myself asking aloud which was more of a brunch liquor, and tequila won because we felt like it, even though vodka had more of a morning feel to it. Yeah.) We also watched a lot of House of Cards and spent much time unpacking our swirling feelings around Top of the Lake and a few minutes unpacking Star Trek 2. I went to an exhibition launch at the City Art Gallery on Friday night and drank a lot of wine and all of a sudden it was Monday morning and all of today stretched out before me. It all stretched out before me, because I slept in for seven minutes. On my day off. My body is annoying. And then, also annoying, I spent a lot of the morning curled up on the floor sniffling, on account of our landlord rebuffing Tim and I not once, but twice, in our request for a pet cat. Whether or not you’ve noticed that I talk about cats quite a lot, or have one tattooed on me, or have three paintings of cats on my wall, or whatever, the fact is I want a cat with every molecule of my being. It physically hurts my heart. And we just can’t have one, despite there being nothing in our tenant information about not having pets, or indeed, any reason whatsoever from our landlord, despite my very persuasive email. And apparently my yelling “I’m gonna take this to City Hall!” will have no effect, well, according to Tim. I really don’t want this to be the end of the road for Tim and Laura Having A Cat, but also I acknowledge that I’m not Leslie Knope and this isn’t a comical episode of Parks and Recreation where plotlines will be wrapped up neatly after some toiling. But I also feel like I can’t simply stop trying. Is there some kind of tribunal for if your landlord makes you cry because they just say no to a cat, without saying why? But as I said, I did do some baking, as a means to a very specific end: work snacks. A few different factors – money, time, disorganisation, listlessness, money again – mean that my lunches for work are generally terrible. In that I’ve recently been having instant noodles for lunch, and that’s a distinct step up nutritionally and delicious-wise from what I used to eat. It’s a bit stupid but it’s the way it is: I can make myself elaborate (or at least decent) dinners or pretty weekend brunches or huge cakes, but I struggle to put any effort into lunch for work. Maybe because it’s hard to throw lots of time and money into something you’re going to wolf down under fluorescent lights, maybe because it’s hard to make something that is filling and that you look forward to and that you won’t get utterly sick of after five days (instant noodles, looking at you.) Maybe it’s just because I’ve only recently started to think about it, and it’s easy to fall into habits that require the least from your brain. Kinda typically, I completely screwed up one of my ventures, the granola bar. We might call them muesli bars in New Zealand, but that to me recalls memories of primary school morning tea, grimly dry, mealy, oaten briquettes which came in boxes of six or eight and occasionally had a mean sprinkling of chocolate chips on top or some vague apricot flavour. And also, oddly, a listening comprehension test from the same time where the narrator pronounced the word “muesli” as “mooooslie” and it was very distracting. Granola bars sounds a little more freewheeling and chewy and American and cool. I made this recipe for Date Orange and Almond Granola Bars from The Moveable Feasts, a food blog I love – the author Amy just seems like someone I’d get on with in real life, and she is beautifully descriptive about food but in a relaxed way…I don’t know, a lot of food blogs these days have a really strange energetic style that I not only don’t enjoy reading, but also it blurs them all into one. This one though: it’s good. 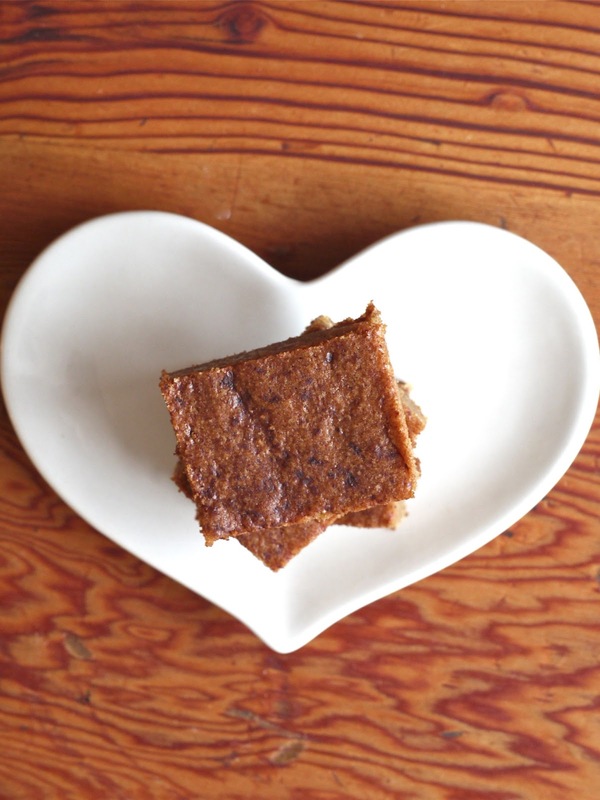 And this recipe seemed exactly what I was after to take to work – something sustaining and easy to make, and yet still snacky and sweet and enjoyable. I then somehow added three times the required amount of oats. I don’t know how or why, just my usual heedlessness I suppose – it wasn’t till the next day that I worked it out – but it basically turned into granola, really really good granola, so all is not lost. Just diverted. I now have a container to take with me to work for eating by the handful, the spoonful, or the milky bowlful, depending on my needs. 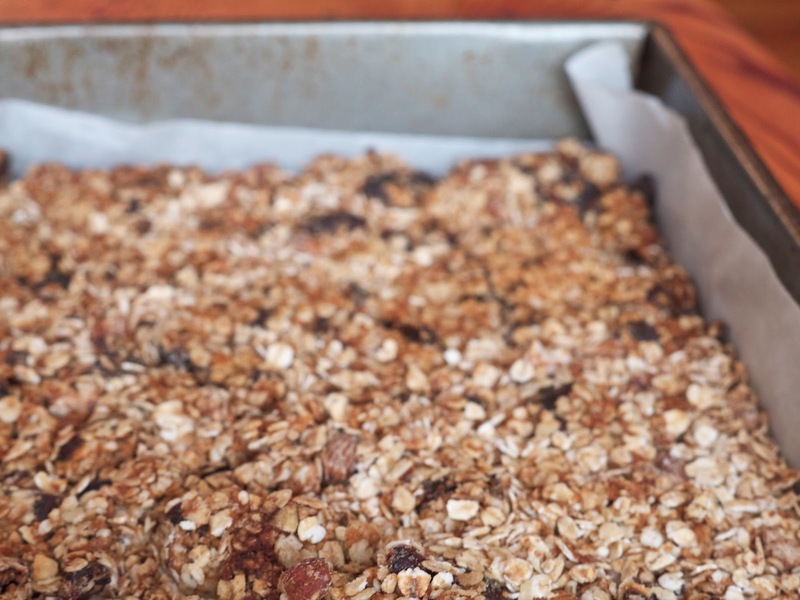 So if you want to make the granola bars, just follow the link, and if you want to make this into granola bar granola…just triple the quantity of oats. On purpose. Fortunately the other thing I made worked out just fine. I really like Fine Cooking magazine and figured I’d find something on its website that my brain could happily latch on to. 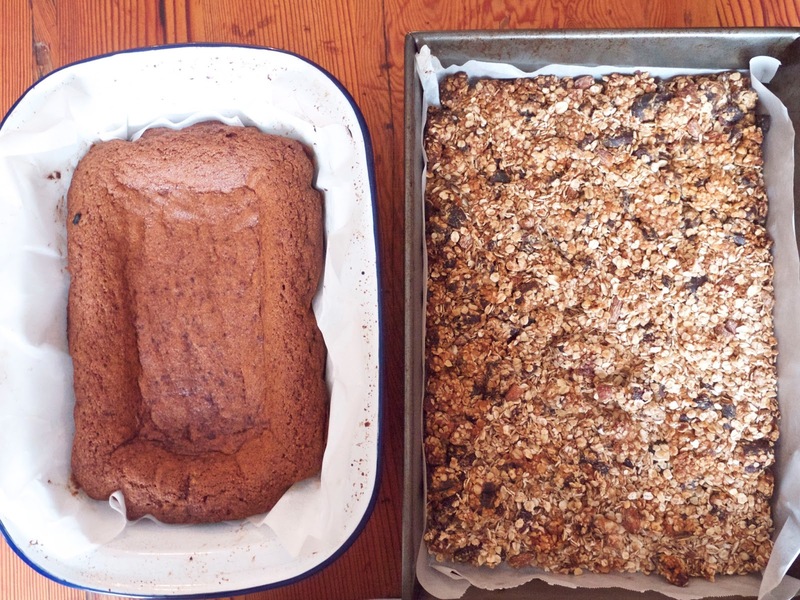 Well, there was a little heedlessness involved here, too – this is supposed to be a recipe for Ginger Bars, but halfway through making it I realised I had no ground ginger. No harm done: I like cinnamon even better. These have all the squish and sweetness of brownies, but with the pure rush of comforting warmth that cinnamon brings. They take about five minutes to make and get better each day. They just taste ridiculously good. Adapted from a recipe from Fine Cooking magazine. Set your oven to 180 C/350 F and line a brownie tin with baking paper. Cream the butter, sugar, honey, golden syrup, cinnamon and salt together till light, airy, and pale. (Also: you should totally eat some at this point, it’s amazing.) Beat in the eggs, then stir in the flour and baking soda. Tip the lot into the brownie tin, sprinkle over a little more cinnamon if you like, and bake for about 25 minutes. It should still be a little tender in the middle, not entirely wobbly and liquidy, but not too firm either. PS: I wrote something about Tim’s and my trip to Nashville for a national newspaper here, and it ended up online, if you want to read it. We loved Nashville so much, I could’ve written triple what I did here. title via: Lily Allen’s LDN. Sunny and grey at the same time. Oh why oh why would I want to be anywhere else? Johnny Cash and June Carter Cash, As Long as the Grass Shall Grow. Just really simple and beautiful. Solange, Stillness Is The Move. This woman cannot make a musical misstep as far as my ears are concerned. I love this airy cover of the Dirty Projectors’ song. Next time: I made some oven-baked risotto and it was as awesomely zero-effort as it was excellent-tasting. I, too, would love a cat. For now I have to be satisfied with patting random cats when walking around the neighbourhood. I giggled at bit when you mentioned the “strange energetic style” of writing. I think I know what you're talking about. I play with different styles myself – sometimes I'm relaxed, sometimes I'm pumped up. Not sure if it's good for readership, but oh well. I like cinnamon but not usually as the star of the dish, this sounds interesting though. And yes, very cute plate! I love the look of the cinnamon bars! I'm the same way about work lunches, I always used to pack yogurt (“easy! healthy!”) but NEVER ended up eating it. I always craved something salty and hot and ended up wasting money on unhealthy junk. Lately I've been packing bread and avocados for the work week and making avocado toast for lunch. Salty, savory, creamy, crunchy, rich, nails all the cravings at once. Regarding the cat issue: I'd convince and/or pay your next door neighbor to get a cat, then train it to come and jump through your window during the evening so you can cuddle with it. Then claim innocence when your landlord gets suspicious! It is a crime that he or she doesn't allow you to have a cat. And awh, those are some seriously nice comments about me. :> I agree with you though, so many blogs just seem to all roll into one with how they write about food. That's also probably the biggest reason why I got so into your blog– you write in a seriously awesome and honest way, whether it's about food or not. 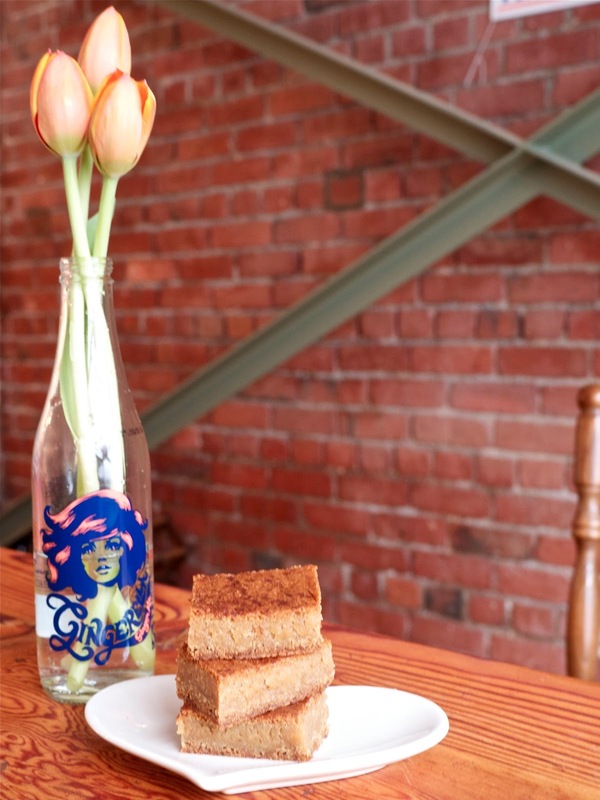 And are these cinnamon bars like blondies? They look so good. So sad about the kitty situation. And so mean that your landlord wouldn't give you a reason! I'm so proud of your bettering lunch situation though! Yeah energies! Yeah granola! Bleakness be gone! These would make ANY day…no matter how frustrating…infinitely better! Yum! Okay, now I have to unload my Top of the Lake feelings onto you, because I don;t know enough people who have seen it & I need to talk it out. – It bugged me that there was only ONE Maori character and he had a history of violence that was irrelevant & unnecessary to the plot. – It was weird to see American actors talking with a NZ accent (Elizabeth Moss) and NZ actors talking with an American accent (Robyn Malcolm). I thought Elizabeth Moss was great though. – The women were so helpless, although that seems to be a strange quirk of Jane Campion's. – What was up with that Chimpanzee back story? You need to spend four months haranguing your landlord about your desire to own a llama. Then when you counter, at the end, with a cat as something you will “I guess accept instead of a llama”, he's bound to say yes. So… I just assumed that everyone did this, but in our household (where we too tend to cook elaborate dinners a lot of the time) we deliberately cook more than we need almost every time and – hey presto! – there's lunch for the following day! Is that too simple? It's hard to think of many meals that don't taste even better the next day, and it requires virtually no effort since you're already doing the dinner-cooking anyway. Am I missing something? Why does everyone not do this?? Also, mega-boo to your landlord. Your place looks so nice too! Does s/he come round much? I have lived in many a flat with secret pets. It can be done! Also, also, House of Cards! Just gets better and better! Wish the next series was already here! Why is Kevin Spacey such a good creep?? Avocado on toast is the best thing ever! Alas, we have no toaster at work, or sandwich press (some kind of fire regulation thing) which eliminates a lot of options. 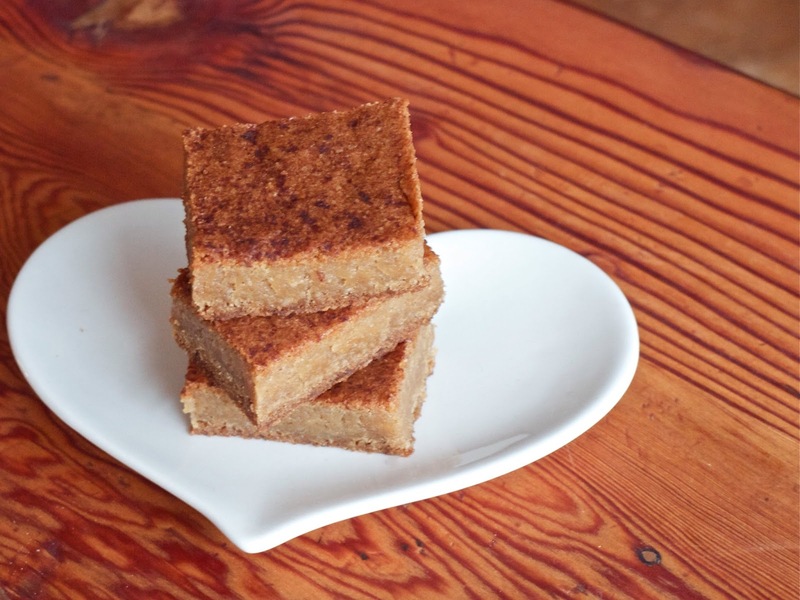 The cinnamon bars are rather blondie-like. I couldn't believe how fudgey and soft the texture ended up, it's such a great recipe.